M. Chekroun, A. Maurel, G. Lagubeau, V. Pagneux, P. Cobelli, A. Przadka & P. Petitjeans, Space-time resolved experiments for water waves, Proceedings du 5th Workshop on Quantum Chaos and Localisation Phenomena publé dans Acta Polonica, 120, 6A: 142-148 (2012) (pdf). 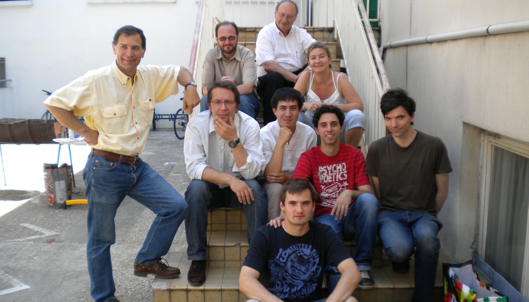 P. Cobelli, A. Przadka, P. Petitjeans, G. Lagubeau, V. Pagneux & A. Maurel, Different regimes for water wave turbulence, Phys. Rev. Lett. 107, 214503 (2011) (pdf). P. Cobelli, V. Pagneux, A. Maurel & P. Petitjeans, Experimental study on water-wave trapped modes, J. Fluid Mech. 666, 445-476 (2011) (pdf). G. Lagubeau, M.A. Fontelos, C. Josserand, A. Maurel, V. Pagneux, P. Petitjeans, Flower patterns in drop impact on thin liquid films, Phys. Rev. Lett. 105 184503 (2010) (pdf). A. Maurel, V. Pagneux & P. Petitjeans, Water wave experiments – Tourbillonde, Conference on the Mesoscopic Physics in Complex Media, MESOSCOPIC PHYSICS IN COMPLEX MEDIA 02001 DOI: 10.1051/iesc/2010mpcm02001 (2010) (pdf). P. Cobelli, P. Petitjeans, A. Maurel, V. Pagneux & N. Mordant, Space-time resolved wave turbulence in a vibrating plate, Phys. Rev. Lett. 103 204301 (2009) (pdf). P. Cobelli, V. Pagneux, A. Maurel & P. Petitjeans, Experimental observation of trapped modes in water wave channel, Europhys. Letter 88, 20006 (2009) (pdf). A. Maurel, P. Cobelli, V. Pagneux & P. Petitjeans, Experimental and theoretical inspection of the phase-to-height relation in Fourier Transform Profilometry, J. Applied Optics 48(2), 380-392 (2009) (pdf). P. Cobelli, A. Maurel, V. Pagneux & P. Petitjeans, Global measurement of water waves by Fourier Transform Profilometry, Experiments in Fluids 46 1037-1047 (2009) (pdf).